Sydney Taylor Honor Award Winner Black Radishes is a suspenseful WWII/Holocaust story, in which one boy learns what it means to be Jewish and French at a time when everything is changing. Gustave doesn't want to move from the exciting city to the boring countryside, far from his cousin Jean-Paul and his best friend, the mischievous Marcel. But he has no choice. It is March of 1940, and Paris is not a safe place for Jews. When Paris is captured by the Nazis, Gustave knows that Marcel, Jean-Paul, and their families must make it out of the occupied zone. And when he learns that his new friend Nicole works for the French Resistance, he comes up with a plan that just might work. But going into Occupied France is a risky thing to do when you are Jewish. And coming back alive? That is nearly impossible. And don't miss Skating with the Statue of Liberty, the gripping and poignant companion to Black Radishes, which follows Gustave as he embarks on new adventures in New York City. SUSAN LYNN MEYER is the author of Black Radishes and, its companion, Skating with the Statue of Liberty. Meyer grew up in the United States, where her father, along with his sister and mother, found refuge after escaping Nazi-occupied France in 1942. Both books were inspired by stories she heard growing up. 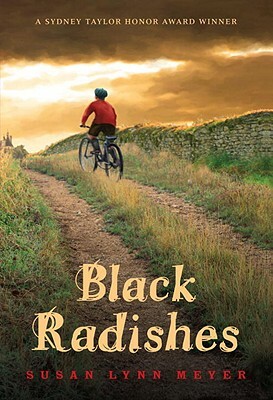 Black Radishes was Susan's debut novel and is based on Meyer's father's years in Saint-Georges and his family's eventual escape to America. It won a Sydney Taylor Honor Award and was named a Massachusetts Book Award finalist and a Bank Street College of Education Best Book of the Year. She lives with her family in Massachusetts and teaches literature and creative writing at Wellesley College. Learn more about Susan by following @SusanLynnMeyer on Twitter and finding her on susanlynnmeyer.com.